*Updated for 2016* – Sneakerheads are sneakerheads for a reason and that reason is that they are very particular about their shoes and anything related to shoes. Whether you’re their mom, girlfriend, best friend, just a friend or co-worker, there’s going to be a time when you’re going to run out of gift ideas. Get your kicks knowledge up. All the best limited editions and collaboration sneakers compiled into one book. See over 300 designs those including Futura, Stash, Pharrell and more. Hands down the best sneaker cleaning system out in the market today. They provide everything that helps you bring your old kicks back from back of the closet death. A great way for the sneakerhead in your family to stay in the holiday spirit. An absolute must watch for any sneakerhead that goes behind the scenes of the corporate game and how that trickles down to the streets of urban america. Sneakerheads sweat and therefore, Sneakerheads smell. Get this to help yourself survive their addictions. Nothing like loud socks to help show off your loud sneakers. Get these socks for the sneakerhead who has every shoe imaginable. Now that they have the NBA contract, there’s way more to choose from. Nothing shows off your loyalty like a good ol’ keychain. There’s a collection as vast as the sneaker scene itself, so choose wisely. Made for the Geeky IT Sneakerhead, you’ll find storage capacties starting at 16GB. On average, a sneakerhead wastes 16 hours a year on opening the wrong box in their closet. I’m not sure that’s entirely accurate, but I wouldn’t be surprised. A absolute must for any sneakerhead library. The easiest way to customize your current sneaker lineup. The standard at which all shoe cleaners strive for, Jason Markk is still killing it with this sneaker cleaner kit. If I’m traveling, I’m not smashing my sneakers in a suit case and risk losing my holy grails to a sticky fingered airport worker. I’m getting this and carrying this along with me on the plane. Unique and decorative. The Rastaclat bracelets let everyone know that you’re a sneakerhead without trying too hard. This accessory would be the perfect gift for the sneakerhead in your life for under $20. All moms who want their children to lead happy lives as stylish sneakerheads must buy this book for their young ones. Another book that sneakerheads should get, so that they can understand how the past has influenced the present. 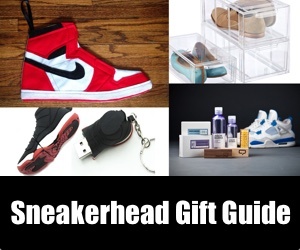 Check back soon as we’ll be constantly updating this gift guide for sneakerheads! Limited edition animated versions of your sneakers. The perfect way to decorate with something you truly love. Clean your Kicks with these sneaker mats, which definitely completes the look of any sneakerhead pad. Make sure your phone is as covered as your feet with these sick iphone cases for every and any sneakerhead. Know a sneakerhead that is also a couch potato? These throw pillows are perfect to knock out two birds with one stone. Probably the most expensive item on this list. These wooden boxes are gigantic and serve as a storage unit for your sneakers. Pins are in. Fashionable, subtle, and unique, the pins allow users to attach them to their wardrobe and just GO! Vinyl is an overlay that doesn’t cause any damage to the product. Stick this design to your laptop or tablet and stunt.